Abu Dhabi: Her Excellency Sheikha Lubna Bint Khalid Al Qasimi, Minister of State for Tolerance and President of Zayed University, affirmed that Zayed University is proud and privileged to bear the name of the Founding Father of the UAE, the late Sheikh Zayed Bin Sultan Al Nahyan, who transformed the desert into a green haven. This came during Her Excellency Sheikha Lubna’s keynote speech during the interactive discussion held at the Convocation Center in Zayed University under the theme of “Leading in a Complex World”, which was led by Her Excellency Dr Amel Karboul, Secretary-General of Maghreb Economic Forum and Former Minister of Tourism in Tunisia. The event was also attended by Professor Reyadh AlMehaideb, Vice President of Zayed University, Dr Marilyn Roberts, Provost at Zayed University, Deans, faculty members, and students. Her Excellency Sheikha Lubna said: “Our guest’s portfolio is pretty wonderful and diversified; it covers a wide range of very interesting items relating to education, culture, and tourism. She is a social entrepreneur, businesswoman, author, and politician. She is passionate about working with leaders, teams, and organizations assisting them in creating breakthroughs in their thinking and transforming themselves. 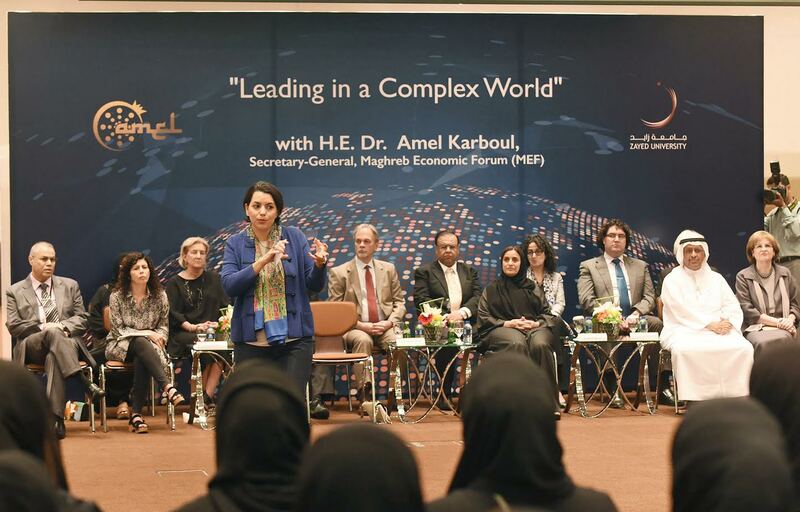 During her discussion with Zayed University students, Dr Amel affirmed that leadership is not a position anymore; however, it is a process that everyone can participate in its creation and progression. “And I see a lot of hope in our younger generations to change the world for a better place,” she added. Dr Amel also emphasized that self-development is not a luxury neither a choice, it is a responsibility. “Creative and critical thinking are essential aspects of the education process and center of effective learning. Responding to the globalization and digitization challenges- with its complex environmental, social and economic pressures, young people are required to be creative, innovate, enterprising, and adaptable, with the confidence to use critical and creative thinking purposefully,” she added.